The Audi TT is a two-door compact sports car manufactured by Audi Hungaria Motor Kft. in Győr, Hungary, since 1998, for the German automaker and Volkswagen Group subsidiary AUDI AG. 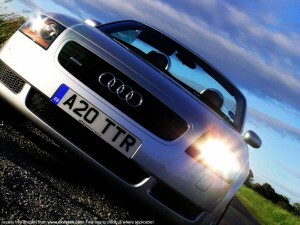 The Audi TT is now in its second generation — and both generations have been available in two car body styles; as a 2+2 Coupé (TT-C), or two-seater Roadster (TT-R). They have been built on consecutive generations of the Volkswagen Group A platform, starting with the A4 (PQ34). As a result of this platform-sharing, the Audi TT has identical powertrain and suspension layouts as its related platform-mates; this includes a front-mounted transversely orientated engine, front-wheel drive or a Haldex Traction-based quattro ‘on-demand’ four-wheel drive system, and fully independent front suspension using MacPherson struts.